AirTech W.L.L has over 10 years experience in the manufacture and installation of ductwork systems in the commercial, retail, public and industrial sectors around the Kingdom of Bahrain. We offer a flexible service, combined with a commitment to meet the demands of today’s construction industry. 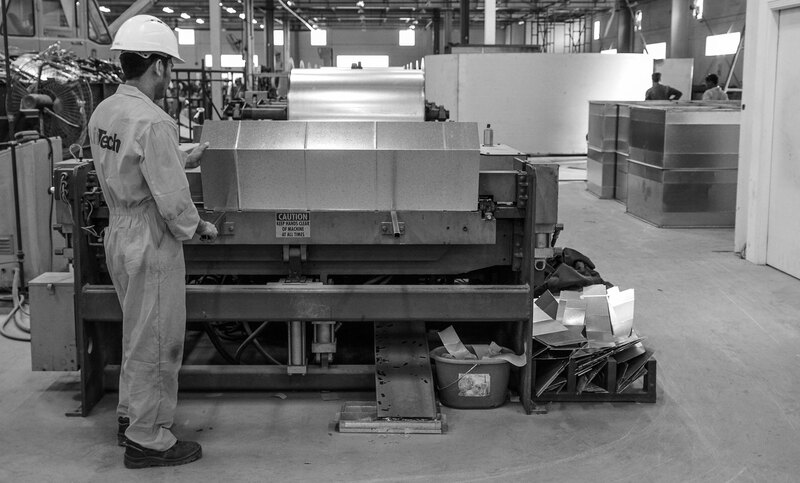 AirTech provide a complete service from ductwork design, through manufacture to delivery to your site, assuring the highest standards in quality and service at every stage. Our highly equipped factory facility offers incredible opportunity for time and cost saving through state of the art automation and computer assisted planning. We employ an experienced design team using the latest in CADCAM software that deliver plans directly to equipment on the factory floor, and which can also work from your own designs, parts lists or project brief. You can find further details of our manufacturing plant on the facilities page, or contact us at any time to discuss your requirements and arrange a full quotation.